Powell Gardens, in partnership with the Kauffman Foundation, manages and maintains the Ewing and Muriel Kauffman Memorial Garden, a picturesque, two-acre garden in the heart of midtown Kansas City. In addition to tending the perennial beds and many unique trees, Powell Gardens staff and volunteers rotate the annual flower displays four times a year. The Kauffman Memorial Garden, a serene and tranquil refuge in Kansas City, is enclosed by beautiful limestone walls and offers wandering brick pathways throughout. The Kauffmans’ world travels inspired the creation of the garden for the enjoyment and enrichment of the community. The space artfully includes plants from both Muriel and Ewing’s heritage by using species popular to Canada and Missouri. All together, the garden features 7,000 plant varieties that include vintage and modern perennials, annuals, shrubs, bulbs and trees. Allee | This beautiful entrance walk features Peking lilac trees, blue ‘Endless Summer’ hydrangeas and other shade-loving flowers. The Green Garden | The centerpiece of this area features an octagonal pool, bordered by a beautiful pergola of overhead planter boxes filled with cascading seasonal flowers and four beds in each corner of the space which contain spring-blooming magnolias. In this space Mrs. Kauffman’s favorite flower, the gardenia, can be found during the growing season. Orangery | Flanking the north side of the green garden and offering a gorgeous gathering place for visitors, the orangery features fragrant seasonal flowers and four large pindo palm trees. The annual holiday display makes the orangery a must-see during a visit to the nearby Country Club Plaza. Parterre Garden | The Parterre “Canal” Garden is home to a majestic pool where bronze figures by local artist Tom Corbin dance playfully in the water. The long canal fountain is lined with a colorful display of annual and tropical plants that change with each season. Paths behind rows of Japanese flowering crabapples feature long borders of beautiful perennial plants. Secret Garden | The secluded Secret Garden behind the orangery features its own distinctive watery accents that delight visitors young and old. Group Tours: To arrange a tour for a group of 10 or more, please call 816-932-1200. The Downtown KC Streetcar starter line is the beginning to the development of a comprehensive streetcar system for the Kansas City Region. The KC Streetcar runs through the heart of downtown and connects to Ride KC buses at either end of the route and at the 10th & Main Transit Center. 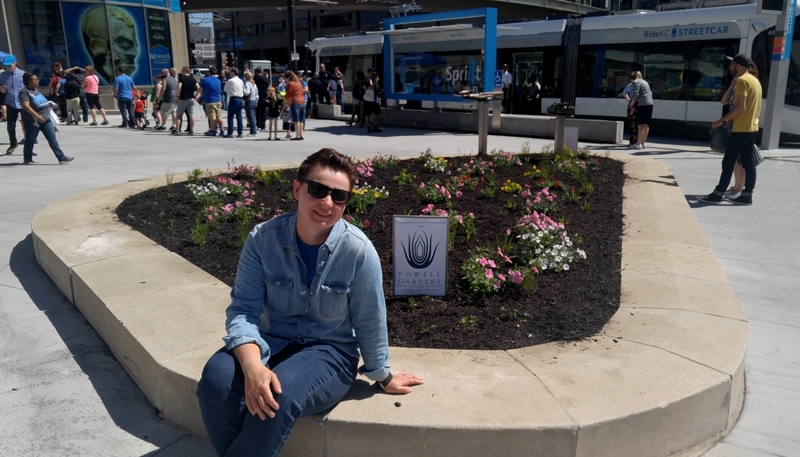 A recent collaboration between Powell Gardens and Union Station of Kansas City, resulted in the planting of the flower beds lining the streetcar stop on Main Street. Planted by Ania Wiatr, Senior Gardener, Island Garden, the two main beds on the east plaza of Union Station have been filled with Missouri Natives such as prairie blazing star, foxglove beardtongue and aromatic aster. These perennial plants will renew each spring and come back fuller and more established with each season. The beautiful, native plantings in the streetcar bed were designed to complement the work of artists Gail Simpson and Aristotle Georgiades. Their pieces, titled Transporters, were created to highlight the major role played by Kansas City in the westward expansion of the United States. 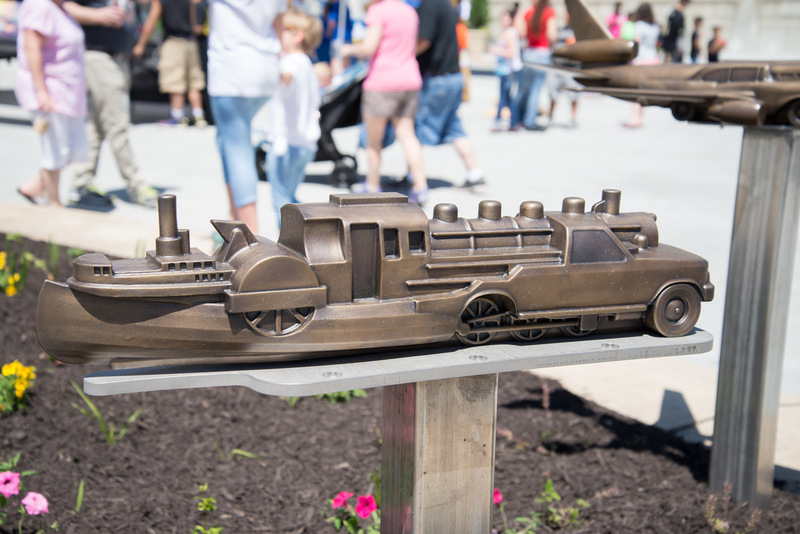 In these sculptures the artists blended parts of multiple forms of transportation into a coherent “whole” to highlight Kansas City’s past while also ushering in the future of transportation in our region. The Municipal Art Commission is responsible for the 1% for Art Program and bringing these wonderful works to our City.